If you go around surveying people, aside from their weight the second next thing they would have had wanted improved would be their noses. The nose is the focal point of the face that isn’t first looked at but can decide the way you will look to the onlooker. Crazy right? Your eyes are the first thing people will notice but the notice can make or break the second look you would have had wanted. So this is where the cosmetic surgery involving noses comes in. but most often, a nose job or rhinoplasty seemed like a major operation for some making them back out at the last minute. So to aid with this, something has been innovated to minimize the major operations—non surgical rhinoplasty. As its name suggests, non-surgical nose job requires no surgery and no general anesthesia. To substitute, most doctors use only numbing creams. No expensive post operative complications then may happen and no sleep. 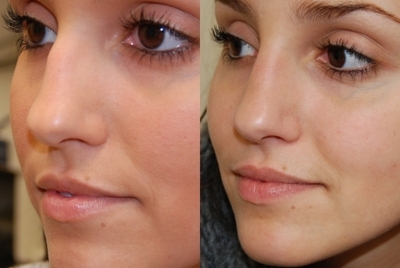 The non-surgical rhinoplasty makes use of injectibles. These injectibles use Radiesse, Botox, Juvederm, Artefill and Restylane. The injection of these substances will only take 15 minutes thus no downtime is incurred. It’s another one of the reasons why it was popular among the working people since it posts no downtime and can bring people back to work right away. When is Non-surgical Nose Job Advisable? The non surgical nose job is not for those who wants to change the size of your nose instead it is only available to those who wants to fill in some small depression around the humps and correct some deviation. It can only last for months so it can be good for those looking for short term results. But it depends on the filler used as well. The filler is often injected in the skin of the nose and not in the nose itself to prevent breathing problems and it is often 8 times cheaper than surgical rhinoplasty. Non-surgical rhinoplasty may be needed to be retouched since it can’t last long. After six to nine months another filler may just be needed. But it can be a good way to check if you look good with nose modified. Of course your first step would be to ensure that you will be having your injection from a respectable and licensed clinic. Remember that non-surgical nose job though not needing some operations is till a medical procedure and not a beauty parlor treatment. These can ensure your safety. And second, of course prepare your budget for it. Before the procedure, your doctor will tell you to avoid some medications such as aspirin, ibuprofen and more for a week or so to avoid complications. After the surgery, your doctor will also try to give you some tips to avoid complications and take good care of your new nose job. After your 9 months is up, you can go and have yourself re-injected again or you can get a permanent nose job instead. It’s all in your choices.